What’s Halloween without a little music? Horror musicals feel like they are a rarity these days with the only ones that stand out in the modern age are Tim Burton’s Sweeney Todd or Repo: The Genetic Rock Opera. But back then, horror musicals weren’t as bloody or heavy handed. They were fun, campy at best and knew when to carry a strong tune. Probably the one that maintained much charm before transitioning into such harder territory was NOT Rocky Horror if you would believe it. 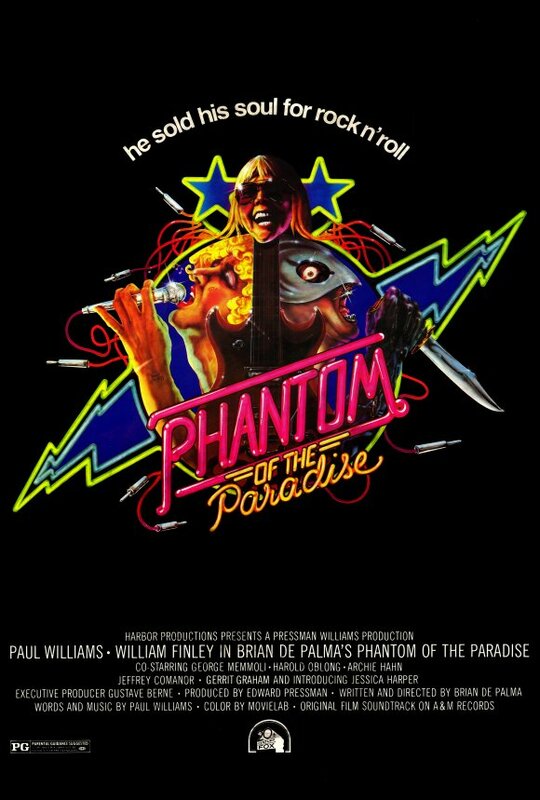 Because one year before the Time Warp, we got Brain De Palma’s “swan song” known as Phantom of the Paradise. Its perhaps more ironic to say just how close both movie musicals were to each other in terms of style and release date. Both are playing up plenty of homages to the classic horror films and were released nearly one year separate from each other with Phantom being released on Halloween of 1974 and Rocky Horror Picture Show debuting on August of 1975. While Rocky Horror goes for the B-Movie route, Phantom is a bit more contemporary as its loosely based on the Phantom of the Opera and Faust story. Its so deeply grounded in the modern 1970s that it feels like a period piece of the time but what keeps it from being dated is the subtext of much interest in different music genre changed over the decades. 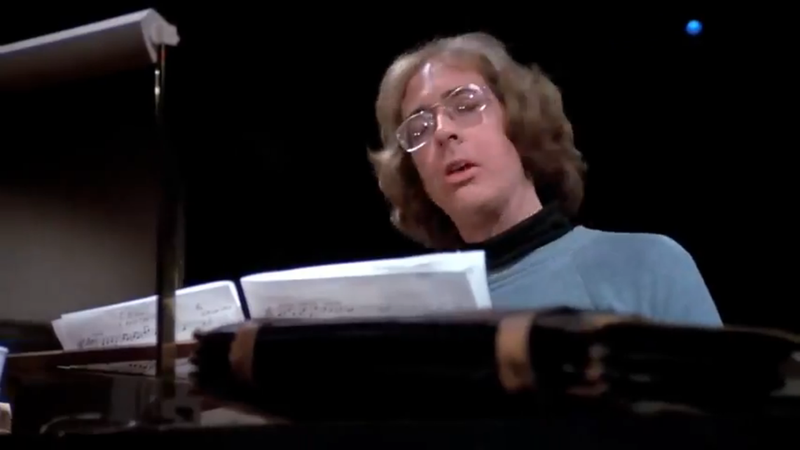 William Finley gives a really sympathetic and strong performance as Winslow Leach who composes a cantata based on the Faust story which catches the eye of a satanic record producer. Right from the start, we easily grow so attached to Winslow and all the trash he goes through when his music is “borrowed” and misused for a 1950s rock band named the Juicy Fruits. After trying to infiltrate the company named Death Records, he finds himself framed, sent to Sing-Sing, has his teeth taken out for a prison experiment and worse of all a disfigured face after he tries to once again destroy his mangled song before it gets pressed to records. Winslow is painted as a common “every man” with a dream to just have his work out there and let it be cherished. But that gets easily tarnished under studio interference to the point you really want to see him get revenge. If that wasn’t enough, the head of Death Records named Swan is probably one of the most despicable yet great villains as far as horror musicals go. Played by a surprisingly well-acted Paul Williams, he seeks to the end of the Earth till he gets his way and won’t let anyone mess with his appetite for a new sound and a song to go with it. You see, he is planning to open a theater for rock musicians called the Paradise and feels Winslow’s cantata is a perfect fit to open it up. Well, it just so happens that Winslow dons a cape and a mask as he tries to sabotage Swan’s plans by attempting to kill off the Juicy Fruits with a bomb. The scene itself feels like a throwback to Touch of Evil as the whole scene is in split screen as we see one camera focused on where the bomb is and the other on everyone else that might get blown to bits with it. Its an intense moment that really pays off with a bang. Its not too long till Swan picks up on Winslow (or the Phantom, in this case) and his destruction as at first we think he is trying to mend some wounds by letting the musician complete his piece but we all know its just a ploy. That’s what I like the most about Swan. He’s just a man trying to find something for gain wither it be music or television ratings. He can be devilish and charming to the point he can con you out of your own creativity and you wouldn’t even know it. I owe this to Paul Williams and his superb acting. You can tell he’s having a lot of fun playing a high powered villain without going too over the top or too soft. He really knows when to feel creepy and subtle at the same time. back at Swan and seeing his music take flight that when we turn to Phoenix we don’t feel really much until the end which I won’t give away. 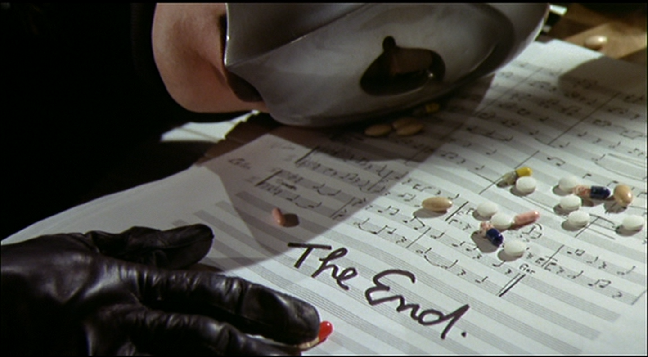 The strongest element of Phantom of the Paradise has to be the music. Not only did Paul Williams play the antagonist but even wrote the songs for the movie as well. Honestly, I can’t think of a moment when I wasn’t getting into the lyrics or the tone of the song. Each one of them represents a decade of music as we go from the greaser days of rock in the 1950s to the surfer Beach Boy tone of the 1960s to at last the glam and macabe rock of the 1970s that reflect musical works at the time like Alice Cooper or Black Sabbath. My personal favorites have to be the opening song “Goodbye, Eddie, Goodbye” for its catchy lyrics and fast paced delivery like a song from Danny and the Juniors, the end credit’s “The Hell of It” for how it bookends such a dark journey and the elegantly haunting yet beautiful “Phantom’s Theme” that expresses Winslow’s dilemma. It almost feels like the movie is taking a trip down memory lane as one song is torn apart and pieced together in reflection of said decade of music which is really clever. One thing I should address is that Swan’s company was originally titled “Swan Song Enterprises.” However, because Led Zeipplin shared a similar name with its record company it had to be changed to “Death Records” in the final cut. Its a shame because the original logo had to be so heavily “censored” that it removes all original intention of Swan’s place in the world. The idea was to make him a corporate giant that was very much in control of everything from music to even television. Its a shame this was lost in editing but the recent Blu-Ray release has some of the original scenes to give an idea how it would have played out in the final cut. This also explains why the press conference scene has a wobbly “Death Records” logo perched over the podium to cover up the original. 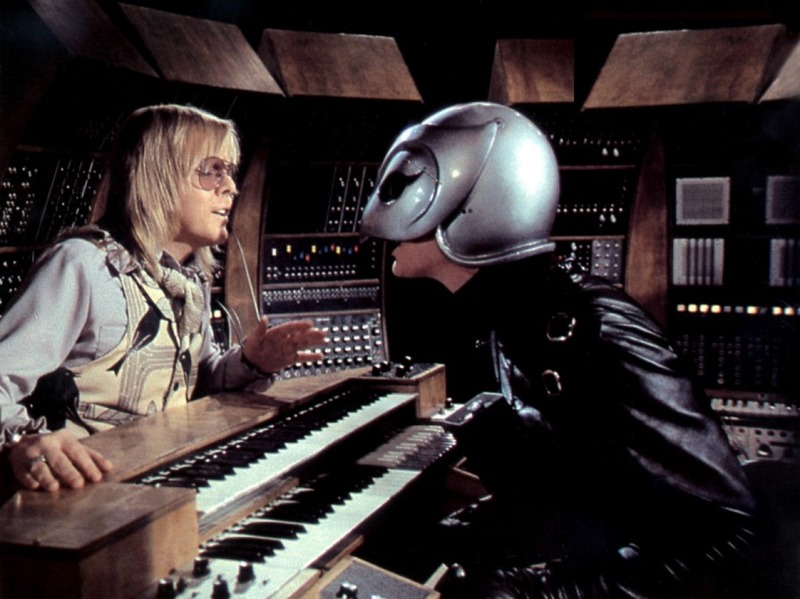 I would go further and explain what else makes Phantom of the Paradise such a great musical but then I would to explain every scene in the movie. Hell, I didn’t even get the chance to talk about Gerrit Graham’s hilarious performance as a self-absorbed glam rocker named Beef who easily steals the show despite how little screen time he gets. This is hands down a must see despite some flaws here and there. But as a whole, its a great send up to not just the classic horror films that would influence the Universal Monsters but also the new brand of music too. To see one man’s song get torn down and adjusted into so many different genres is a unique journey but also a tragic one. What else can I say but give this one a good watch and listen. For if you leave this movie without a note or tune in your head, then something must be wrong with the hearing aid you have. Posted on October 17, 2014, in Horror-Wood 2014 and tagged 1950s, 1960s, 1970s, Beach Boys, campy, Cult Classic, Faust, Glam Rock, Halloween, Horror Musical, Horror-Wood Blog-a-Thon, Jessica Harper, Paul Williams, Phantom of the Opera, Phantom of the Paradise, Phoenix, Rock, Surfer songs, Swan Song, William Finley. Bookmark the permalink. 1 Comment. webpage list and will be checking back soon.